Here's a chance to showcase your ideas :) good to gauge the response and do market survey for your idea as well! The 24hr Challenge, arguably Singapore’s shortest and most exciting business plan competition, is back again this year with not one but three new categories and promises to be a day of heart-pumping excitement. When is it?????? Where is it?????? Who can join????? 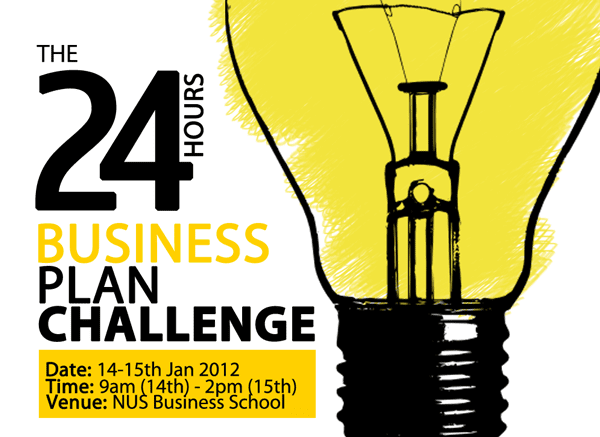 Registration ends on 11th Jan 2012! Day 1 starts with a series of intense workshops on how to write good executive summaries and how to pitch ideas. Then the fun begins when the three categories are announced and teams race against the clock to translate a business idea into an executive summary overnight. Day 2 offers no rest until after you successfully pitch your ideas to the panel of invited industry judges to vie for top spot. if the judges are impressed enough, direct entry to the semi-finals of the Start-Up@Singapore Business Plan Competition 2012, Singapore’s largest and most prestigious, where the prize money is now in the thousands. If you have the adrenaline and the smarts to take on this night race, then join at the 24hr Challenge. Only a maximum of 40 teams can be accommodated for the competition so get in on the action before it's too late. All teams must consist of 2 to 4 members exactly. Teams are not allowed to add or remove team members from the team, once they have registered. The 40 SGD deposit is refundable only at the end of the 24 Hour Challenge. Please note that any team which withdraws from the challenge midway, will NOT get the money refunded. All teams need to compulsorily stay overnight at the 24 Hour Challenge venue. If any team leaves, for any reasons whatsoever, it’ll be disqualified from the challenge. Teams are NOT allowed to change their categories once we have given them the confirmation of acceptance of their chosen category. The executive summary presented by the teams should NOT be that of an already registered company. Teams are NOT allowed to use any additional visual aids during pitches. Any team NOT complying with any instructions will be disqualified from the competition immediately. The judges’ decision is final, and no appeals for re-consideration will be entertained. Additional details will be conveyed to you during the competition itself by the Competition Department. For any queries, please feel free to approach any of the organizers. You can also email the Competition Director Mr. Siddharth Rajgopalan (siddharth@startup.org.sg).